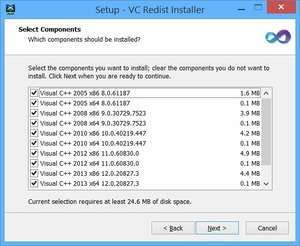 McRip VC Redist is a collection of Microsoft Visual C++ runtimes. The application acts as a downloader and grabs the collection of runtime installation files directly from Microsoft. It installs Visual C++ 2005, Visual C++ 2008 x86 / x64 9.0. Version 1.6.0 is a freeware program which does not have restrictions and it's free so it doesn't cost anything. For security reasons, you should also check out the McRip VC Redist Installer download at LO4D.com which includes virus and malware tests. Additional screenshots of this application download may be available, too. Featuring the very best in free install tool downloads. Editing staff adds reviews and free download links and constantly updates software. Check out some of the freeware downloads available in the install tool category. They contain no strings and are available at zero cost.